Fashioning Africa is a journey into the myriad traditional artisanal techniques found across the continent. 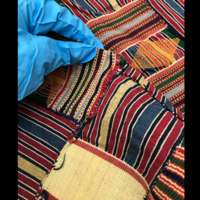 There are six textiles and accessories from the African collection of the Longyear Museum of Anthropology on display. Each object provides a point of departure in the evaluation of the contemporary influence and global impact of African crafting traditions. Students from Professor Ntokozo Kunene’s Fall 2018 Costume Design class have used the objects as inspiration to fabricate their own work displayed alongside pieces in the exhibit. On view January 24–April 14, 2019.